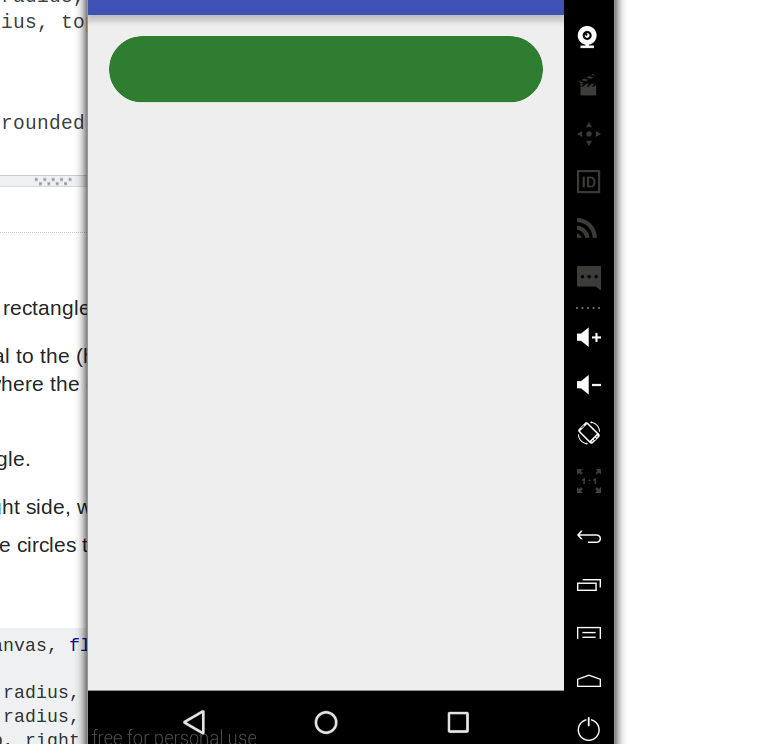 [英]How to use android canvas to draw a Rectangle with only topleft and topright corners round? 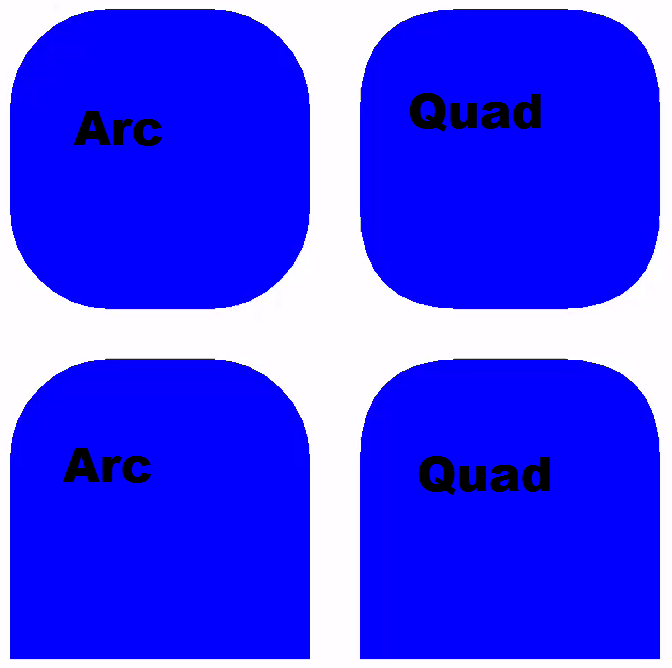 I found a function for rectangles with all 4 corners being round, but I want to have just the top 2 corners round. What can I do? You can draw that piece by piece using drawLine() and drawArc() functions from the Canvas. Use a path. It has the advantage of working for APIs less than 21 (Arc is also limited thusly, which is why I quad). Which is a problem because not everybody has Lollipop yet. You can however specify a RectF and set the values with that and use arc back to API 1, but then you wouldn't get to use a static (without declaring a new object to build the object). path.close();//Given close, last lineto can be removed. You'd want to line all the way to those corner bits, rather than quad across them. This is what setting true to conformToOriginalPost does. Just line to the control point there. If you want to do that all but don't care about pre-Lollipop stuff, and urgently insist that if your rx and ry are high enough, it should draw a circle. path.arcTo(left, top, left + 2*rx, top + 2*ry, 270, -90, false);//top-left corner. So, conformToOriginalPost actually draws a rounded rect without the bottom two bits rounded. Simple helper function written in Kotlin. // Step 1. Draw rect with rounded corners. // so it wont cover top rounded corners. I achieved this by following the below steps. Next is the steps to draw the rounded rectangle. Then we draw a rectangle between these circles to get the desired rounded rectangle. One simple and efficient way to draw a solid side is to use clipping - rect clipping is essentially free, and a lot less code to write than a custom Path. This approach will only work for rounding on 2 or 3 adjacent corners, so it's a little less configurable than a Path based approach, but using round rects is more efficient, since drawRoundRect() is fully hardware accelerated (that is, tessellated into triangles) while drawPath() always falls back to software rendering (software-draw a path bitmap, and upload that to be cached on the GPU). Not a huge performance issue for small infrequent drawing, but if you're animating paths, the cost of software draw can make your frame times longer, and increase your chance to drop frames. The path mask also costs memory. If you do want to go with a Path-based approach, I'd recommend using GradientDrawable to simplify the lines of code (assuming you don't need to set a custom shader, e.g. to draw a Bitmap). With GradientDrawable#setCornerRadii(), you can set any corner to be any roundedness, and reasonably animate between states.